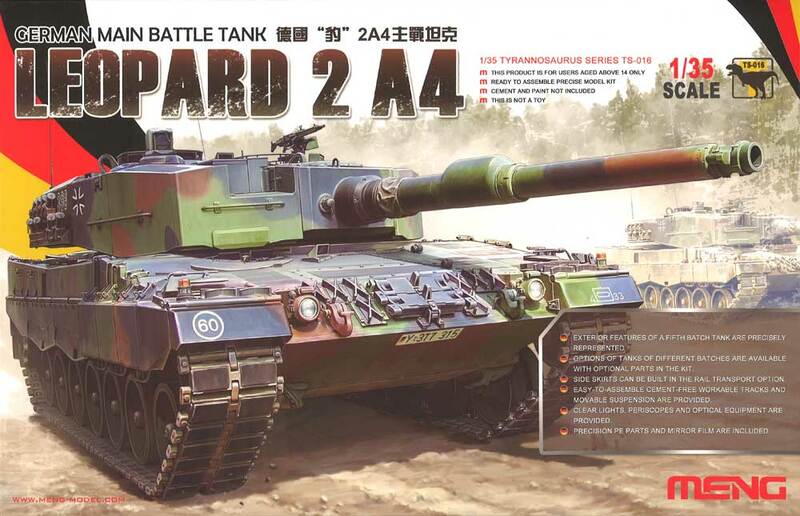 "We need a good, accurate, Leopard 2A4." 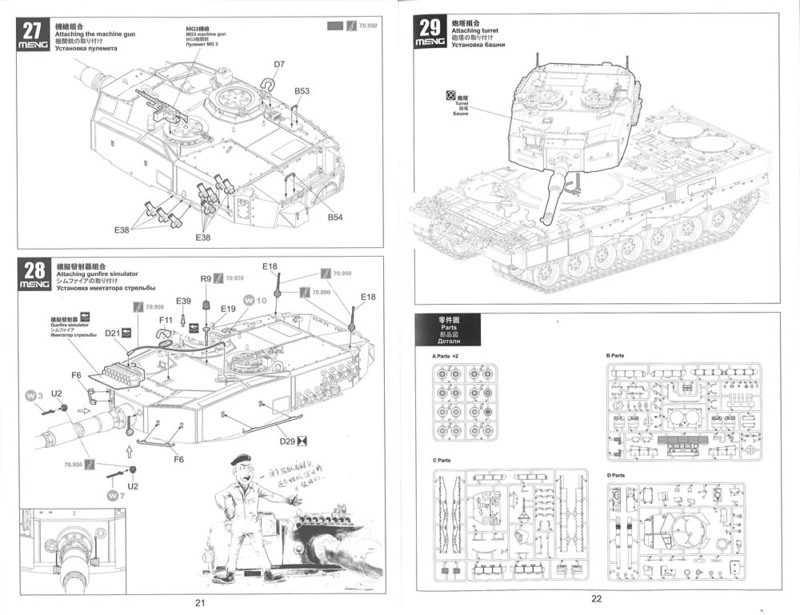 This is what I wrote when I reviewed Revell's last 2A4 (kit no. 03193). 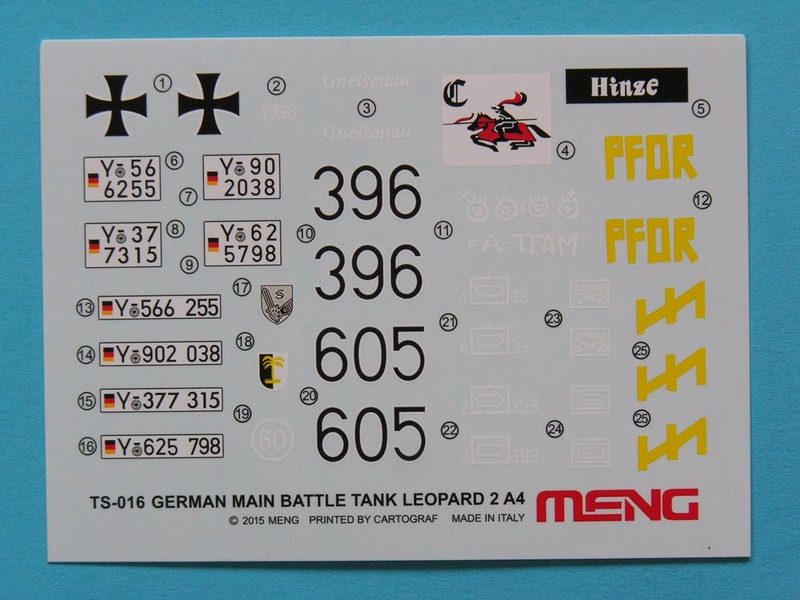 This iconic tank has been poorly treated in 1.35 scale plastic, so has Meng come to the rescue? Let us see what we get. 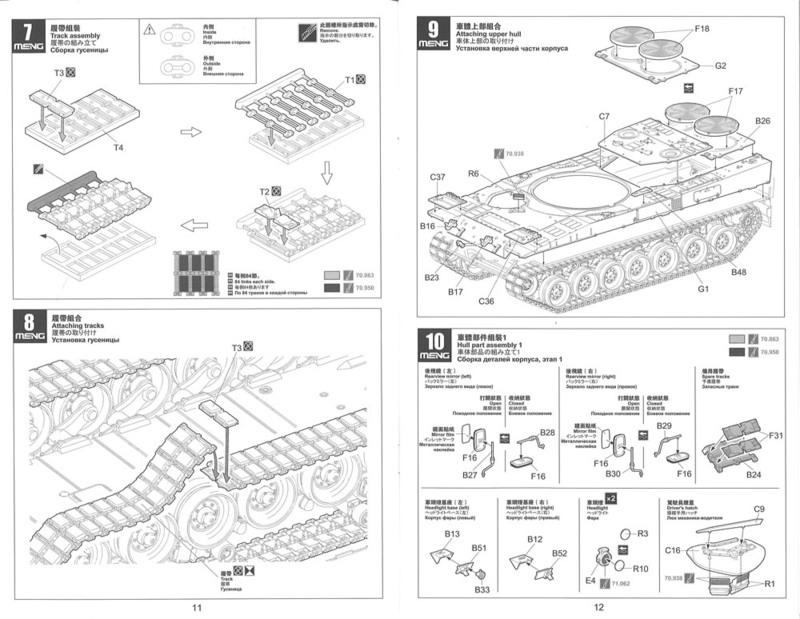 The first thing to notice is the box itself which has a nice image of the tank and notes about its features and options. Everything inside is well packed and certainly fills up the box. 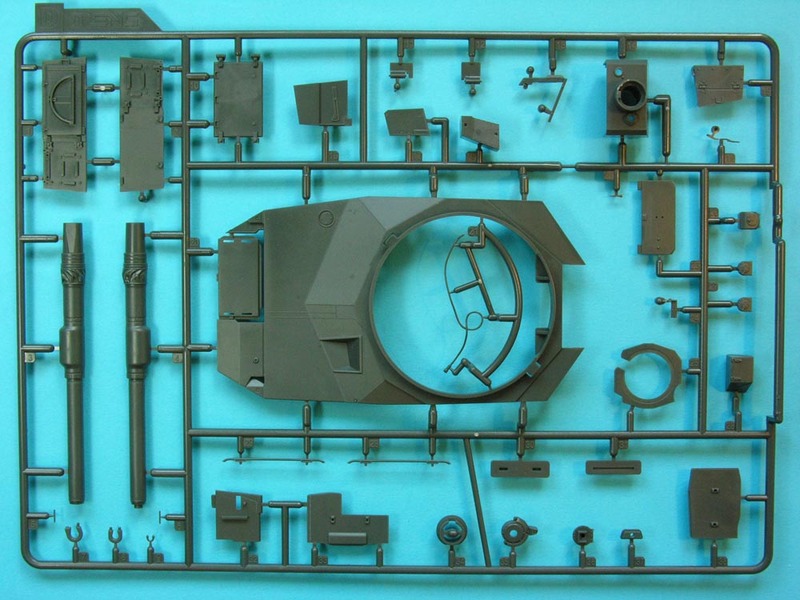 The sprue breakdown is conventional and exactly what you might expect of any tank model. However, the tracks are not vinyl - there is no option. 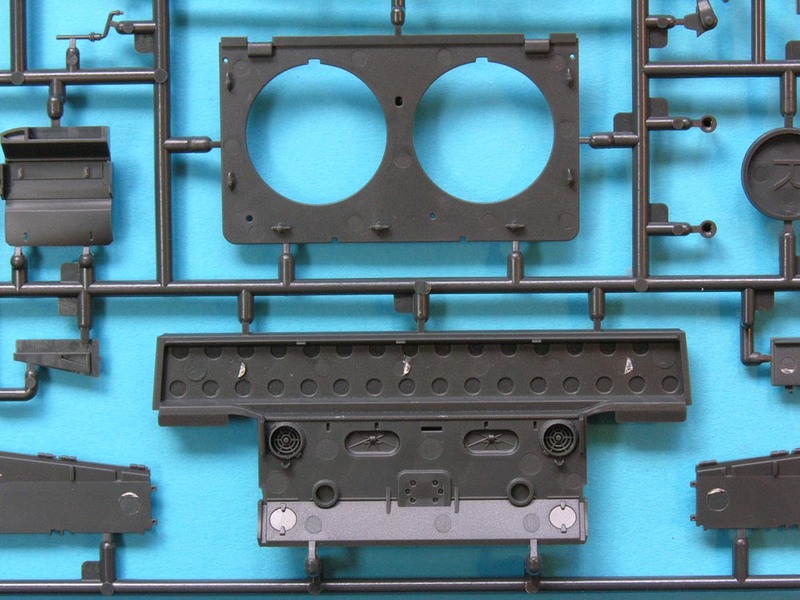 All you get are individual links in styrene. More on these later. You get optional rear engine decks as separate panels (possibly with a powerpack in the offing sometime in the future). You also get optional skirts for both early and later batches. 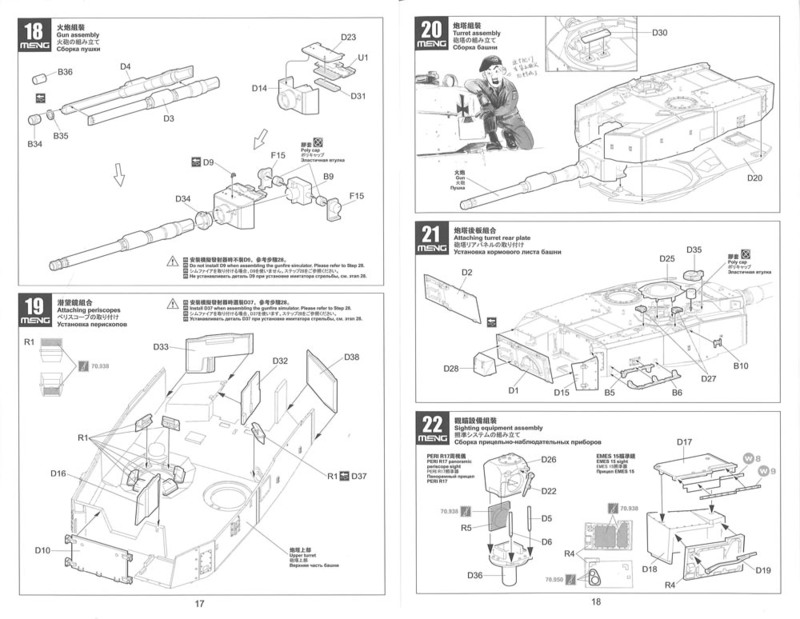 The front skirt sections can also be posed in the transport position as they have detail on the reverse side. Other minor options are included - read on. Markings are limited to Bundeswehr only. 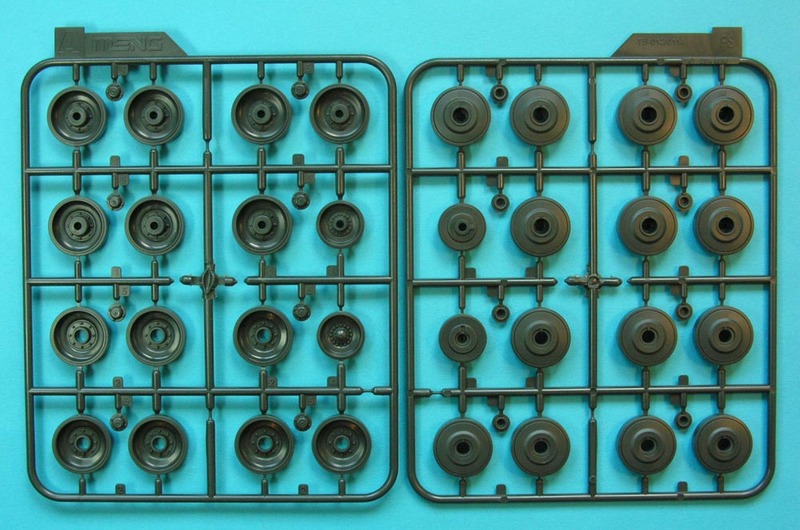 There are nine sprues, two of which are duplicated and one we have four times (the tracks). One is clear and includes periscopes, headlight and sight lenses. 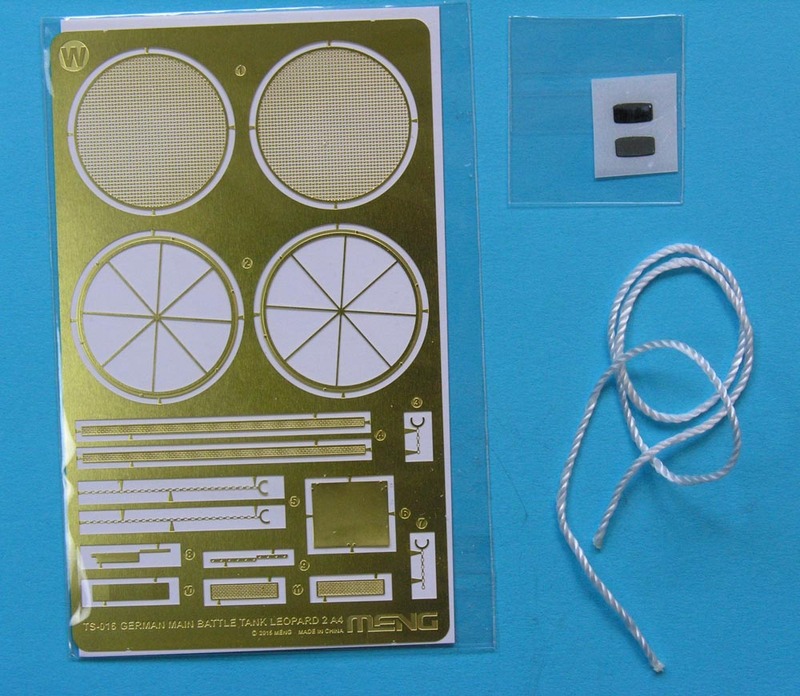 In addition, we have hull top and hull bottom, turret top, an etch fret, silver foil for the mirrors, vinyl (for the mantlet cover, mantlet plugs and polycaps) and an awful piece of string for the tow cables. Apart from the last, the quality of the parts is completely top-notch. 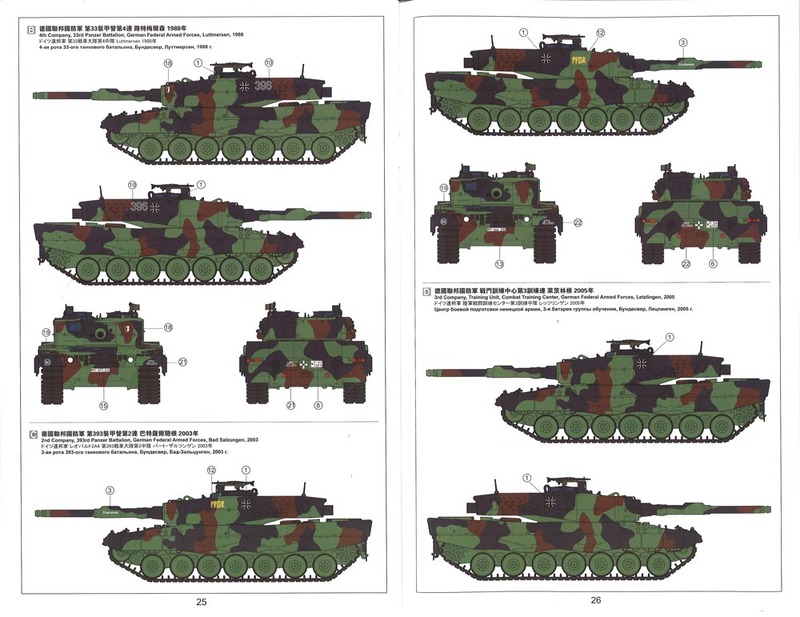 This model is a vast improvement on ANY previous Leopard kit - 1 or 2. It is so good I really don't know what to say. (Yes you did because you wrote this review! - webmaster). 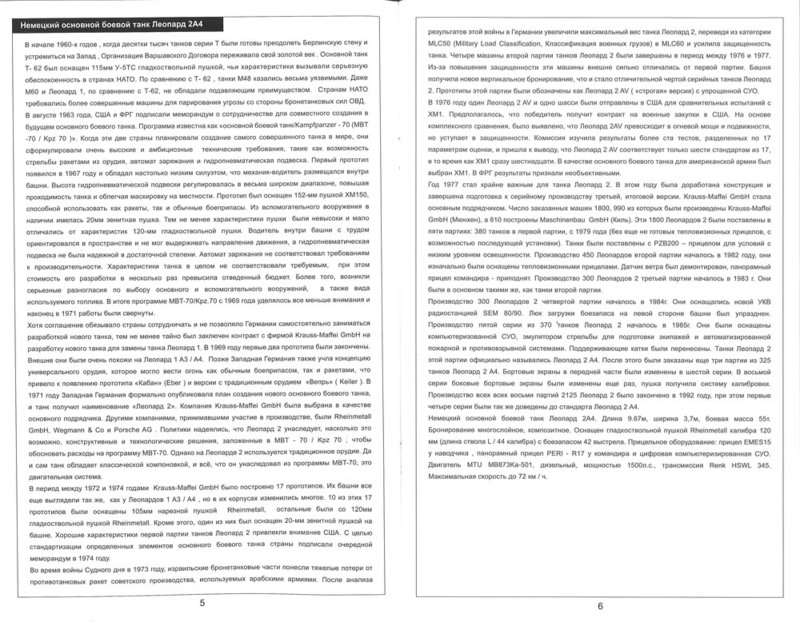 The instructions are in a 28-page booklet with colour on the covers and for the (virtually identical) profiles at the back. 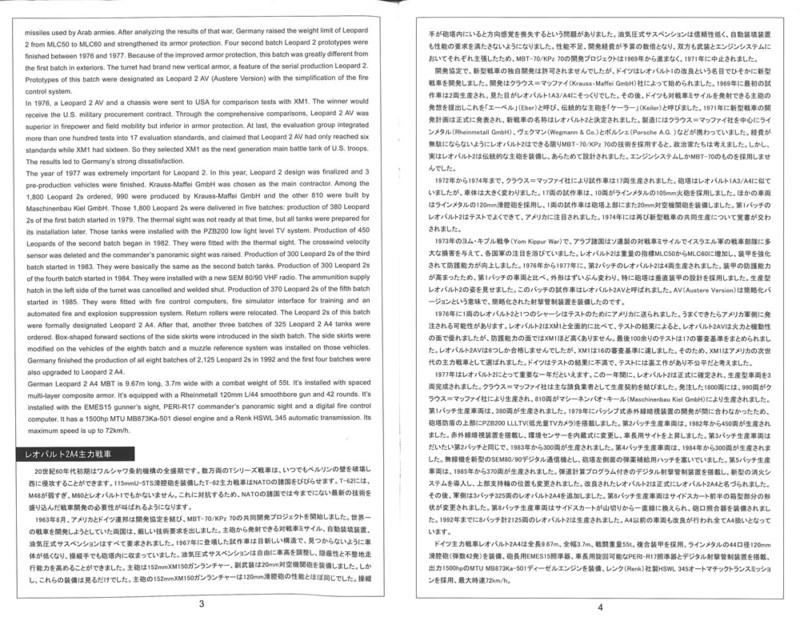 The introduction is quite long in several languages before we get into the nitty-gritty of the 29 building stages. As I said above, there is nothing unconventional about this kit. The suspension has the now-usual torsion bars so the road wheels can be posed on uneven surfaces. The trailing arms have separate faces which have to be slotted over the wheel axles which is slightly unusual. All wheels have polycaps which is good for Leopard Workshop! 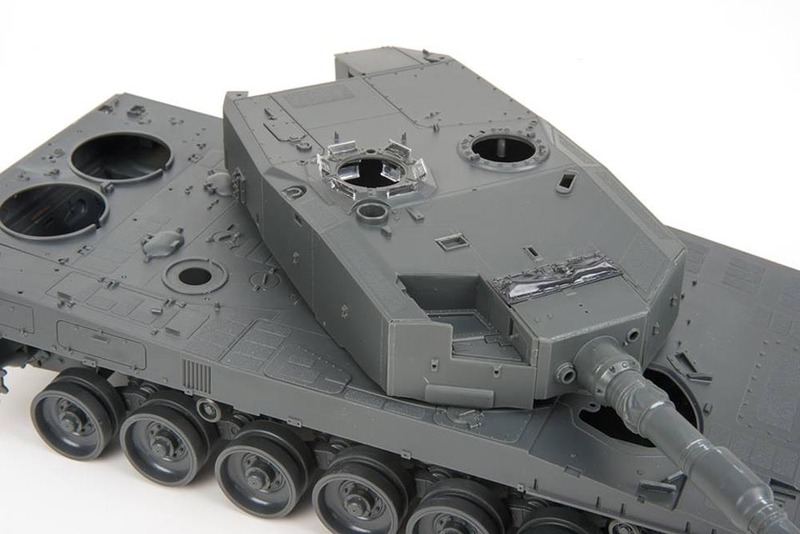 The rear faces DO have some detail on them unlike Meng's awful Leopard 1 wheels, but because of the polycap housing, they are somewhat compromised. Accurate wheels are available here. 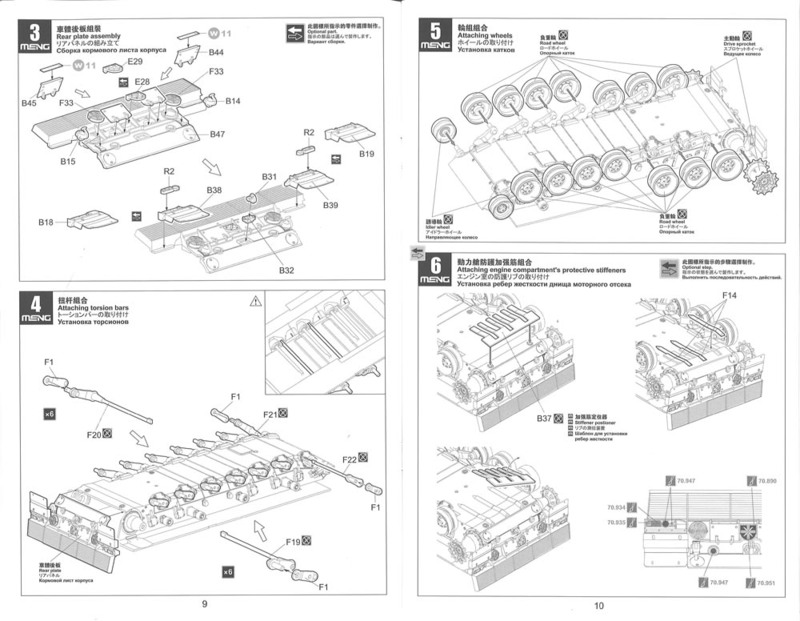 I have checked the fit and the Meng axles are a little thinner than the Leopard Workshop axle holes which were designed for the Tamiya/Hobby Boss wheels. However, they do fit, if a little loosely. The hull tub is beautifully moulded and has location points inside for a possible future powerpack. Even the bolt holes around the sprocket mounting point are represented in the hull sides. The hull top is even better. Everything is very well presented including the weld lines which all have subtle texture on them. The non-slip patches maybe a little it too raised, but certainly nothing to complain about. Grab handles are solid but are easily replaced with wire. One thing might be a problem. 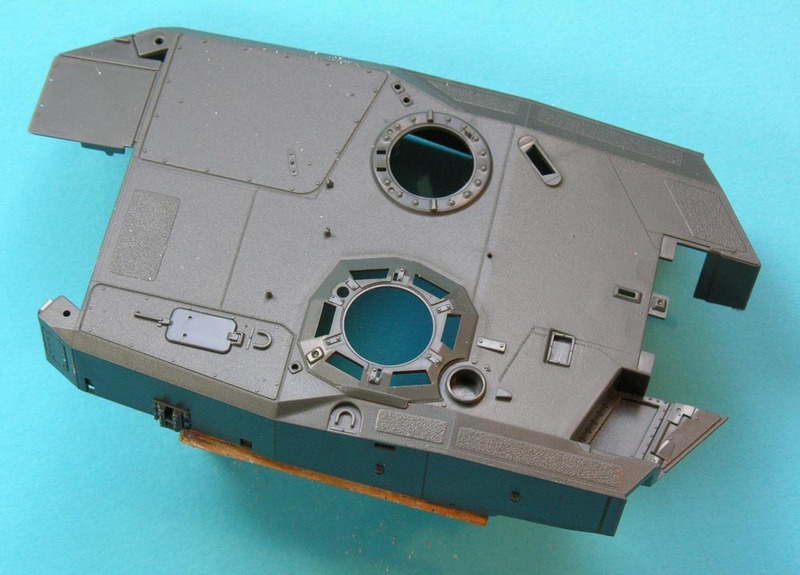 Leopard 2 has a large turret and a common complaint - in all Leopard 2 kits - is that the hull top sags when the turret is mounted, meaning the long turret bustle often touches down on the rear deck. 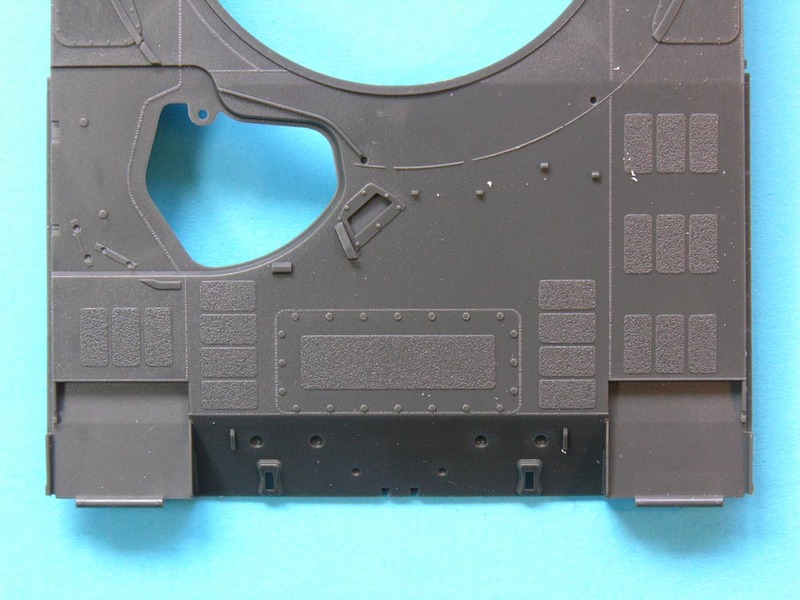 Looking at the hull top straight from the box, it already has a sag in it just behind the turret ring. I would advise gluing in a rectangle of 40 or 60 thou card 95 mm x 5 mm to straighten this up and help support the turret. 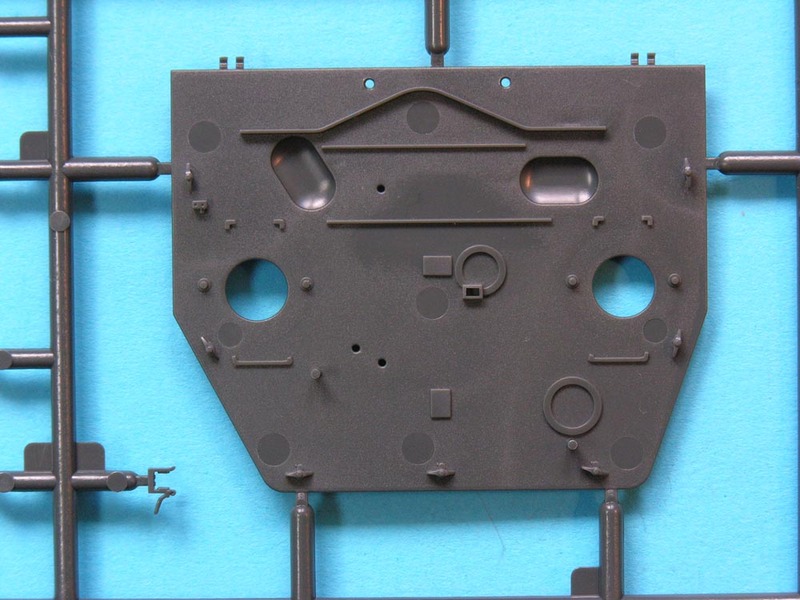 The hull rear plate also has detail on the inside face but also has large ejector marks. The inside of the grille is not represented, however. I guess this will be a separate drop-in piece - if and when. 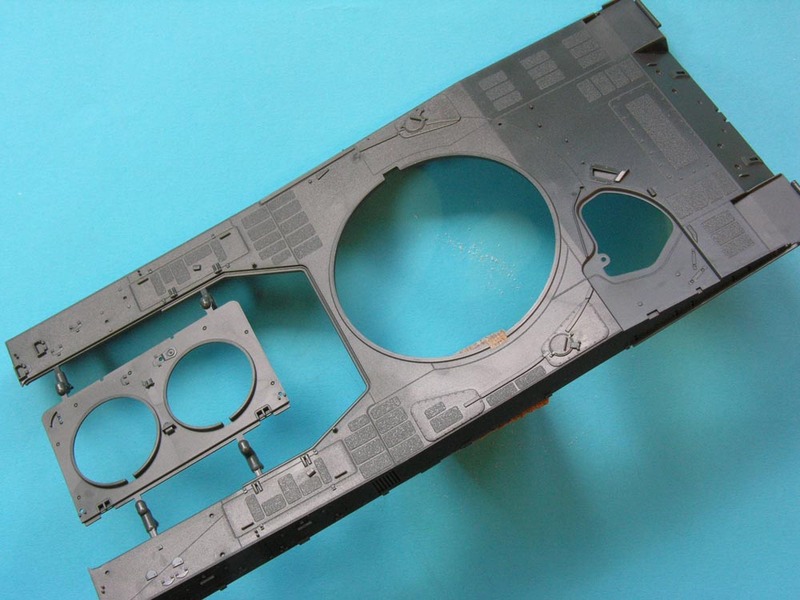 Two rear deck panels are supplied. At first glance they are identical but they do have small differences, so be careful when deciding which version to build. The one moulded and attached to the rear hull is intended for a set of earlier pattern grilles. 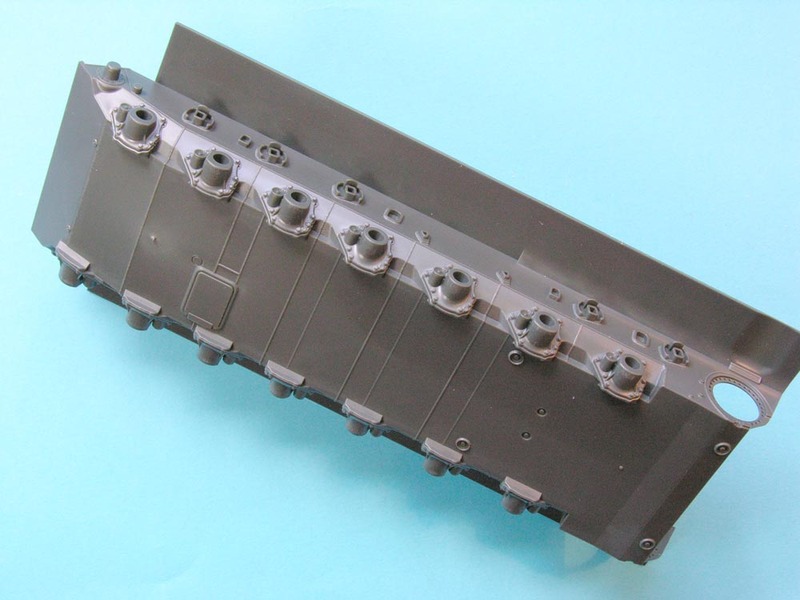 Alternate, later grilles with rubber dampers are also supplied for the second optional deck. These dampers were introduced in 2004 as part of the 2A5/2A6 programme, I believe, so watch the period of your tank when deciding. 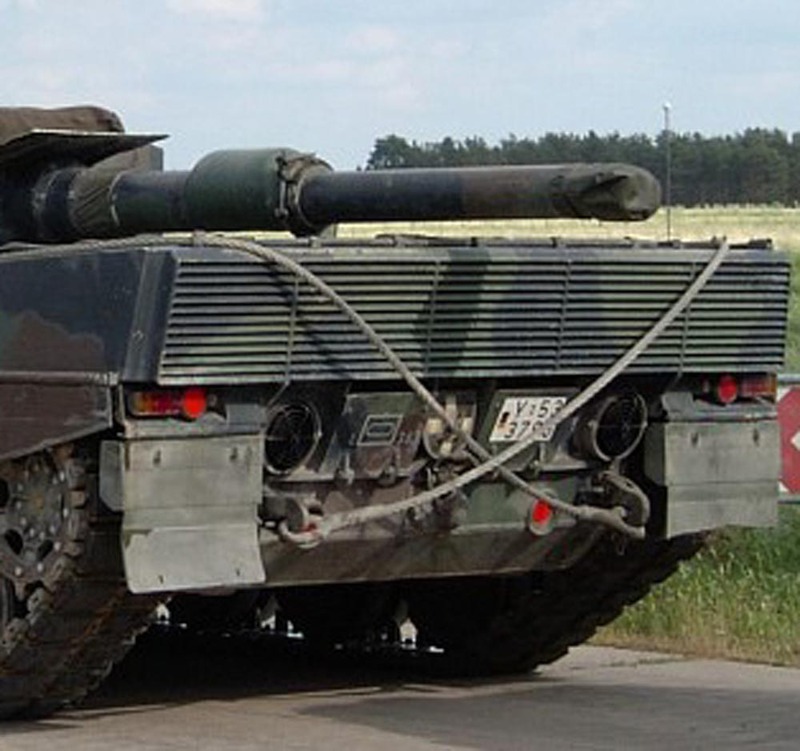 I don't think they would have appeared on Bundeswehr 2A4s, but I stand to be corrected on that. Both decks have some detail underneath. 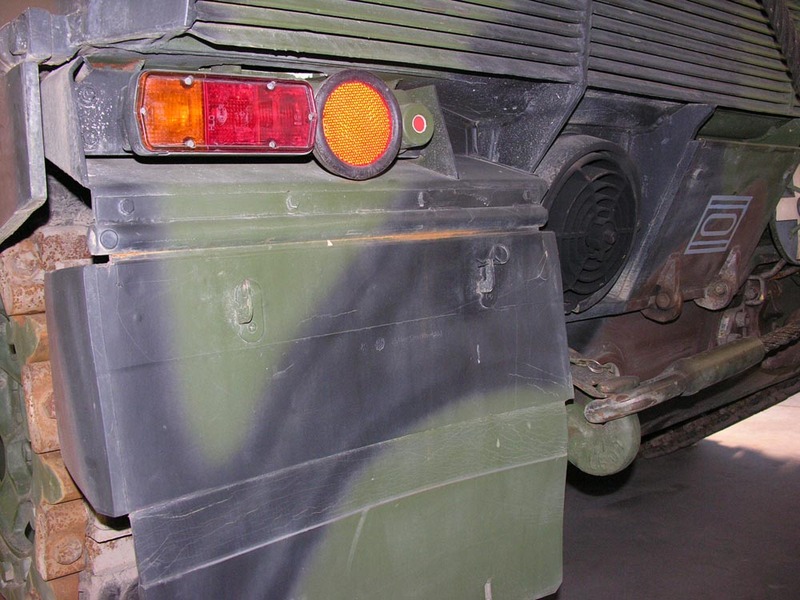 Another option are two types of rear mudflap/light mounts. 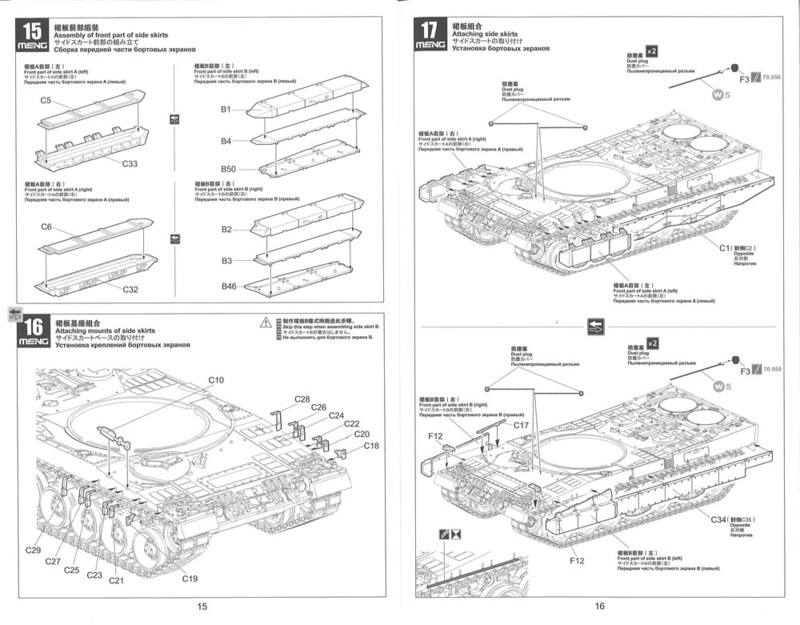 One has a boxed in area on the inside edge which I think is indicative of earlier Leopard 2A0 to 2A3. Of course, these earlier Leos were all upgraded to 2A4 standard and this was left as built. The alternative parts have an open box which seems to be more common, just by looking at photos. 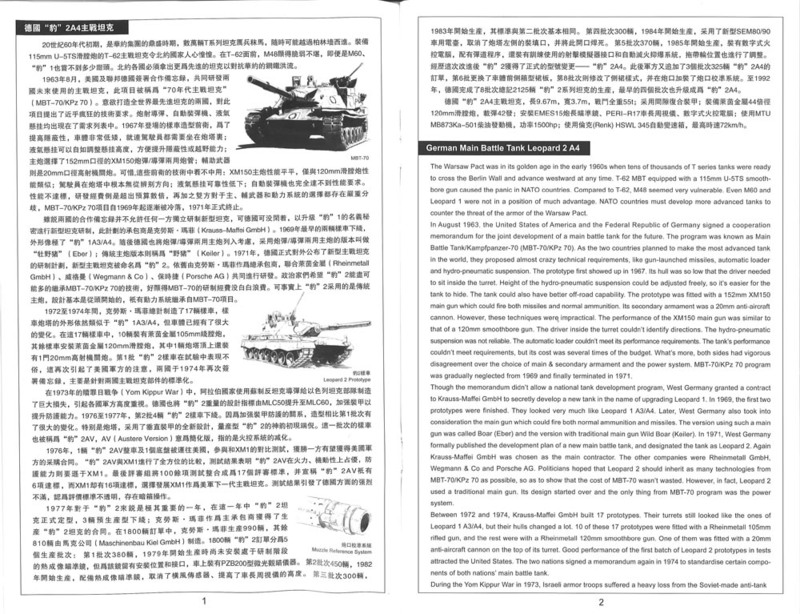 It is also possible that these are just small factory differences as Leopard 2s were built by both KMW and MaK. The lights themselves are clear plastic. Even the convoy light has options. Two are supplied - clear or normal. Etch screens are supplied for the tops of the two rectangular vent boxes which is a nice touch. 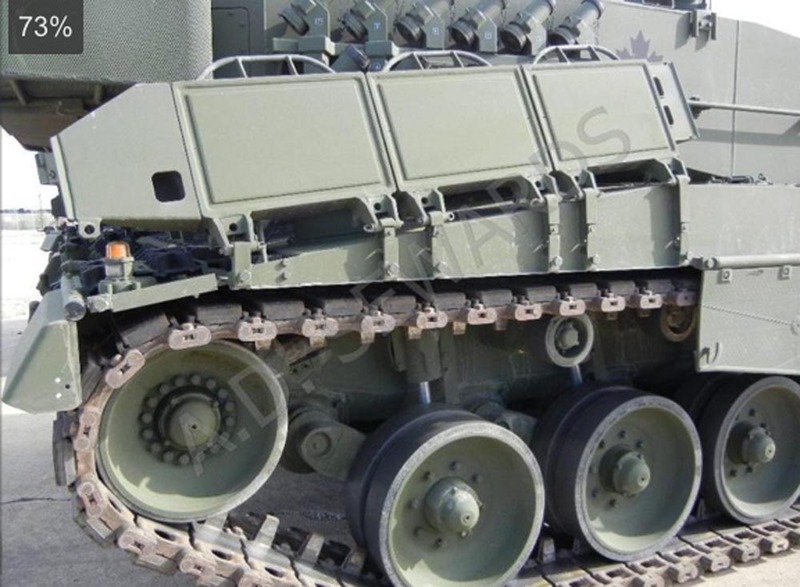 Yet another option are reinforcement strakes under the rear hull. 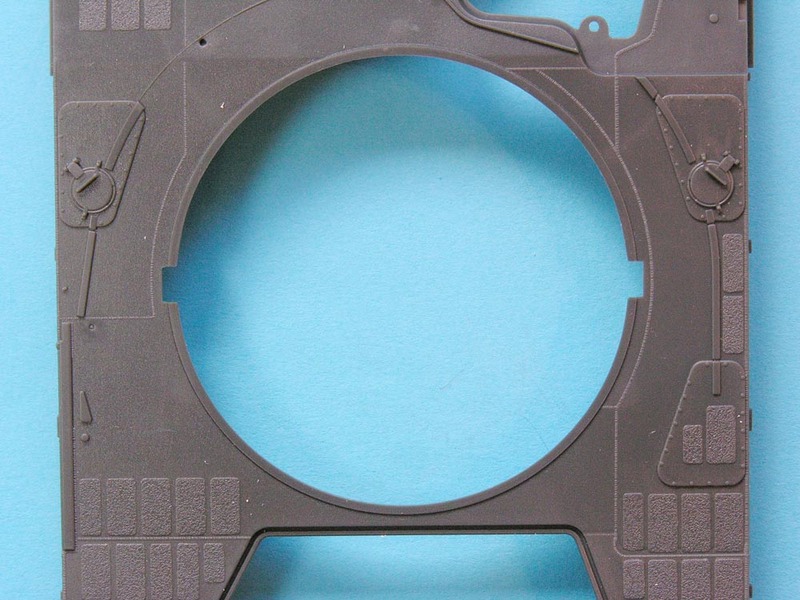 A plastic template is cleverly supplied for positioning these. However, these were very uncommon on 2A4, especially Bundeswehr machines. KMW did offer these as a factory mod so just a few may have been fitted. 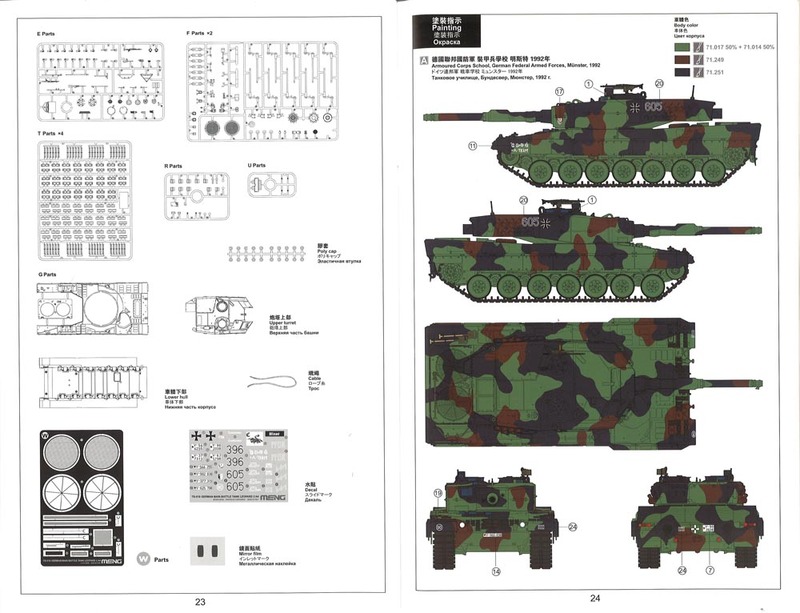 They have been added on some export versions for Finland and Greece (not covered in this kit's decal options). These would be appropriate for any future export releases or possibly 2A5/2A6. 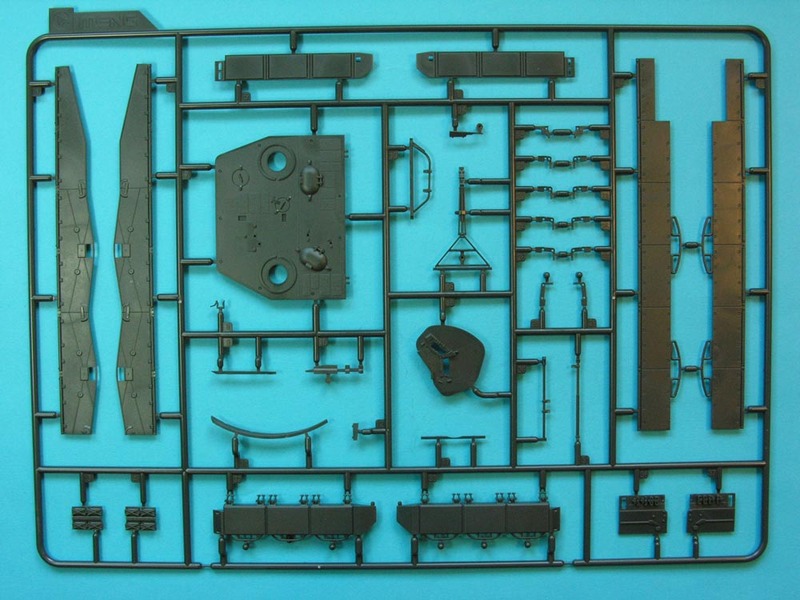 Meng have treated the tracks in a similar way to the Leopard 1 tracks (SPS-016) except each link is only made from three parts instead of the Leo 1's five parts. 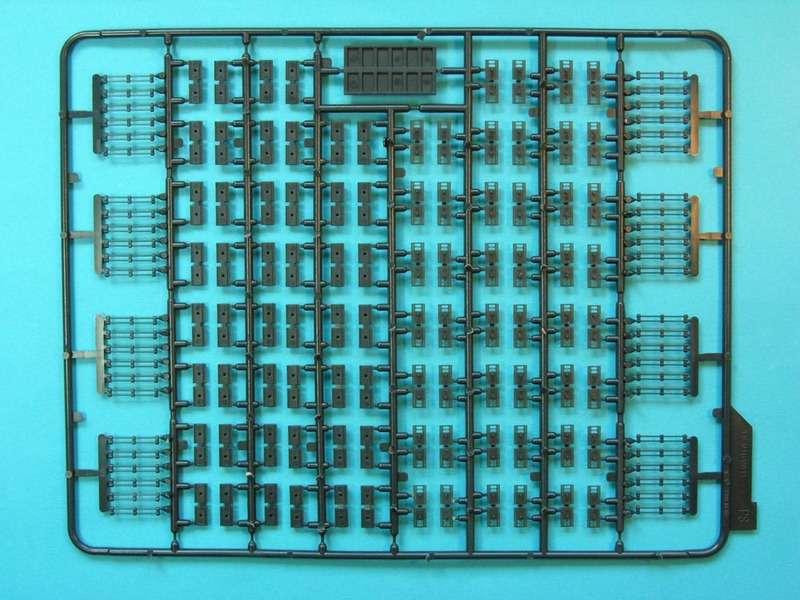 In fact, they are very similar to Bronco's tracks, but the pads are more in scale and they have more finesse. 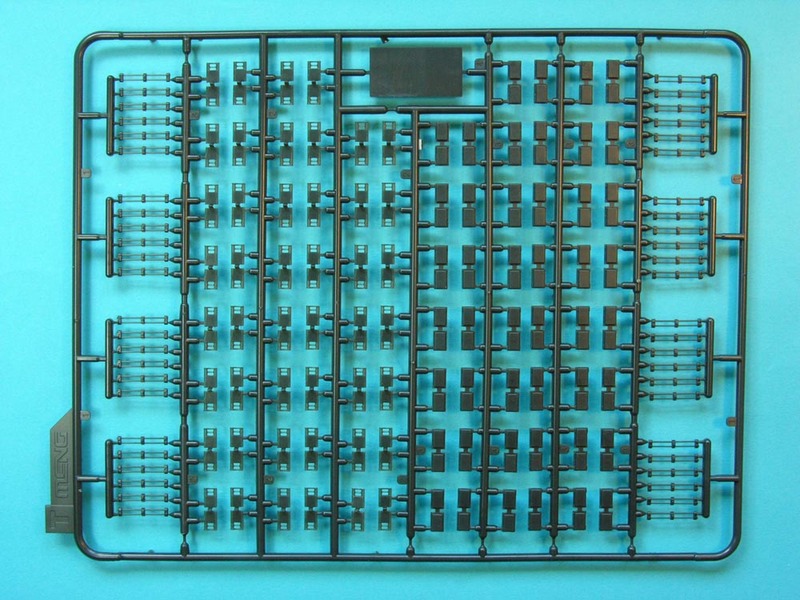 There are inside and outside faces on the end connectors and these are noted in the instructions - so make sure you build them the correct way round for left and right tracks. 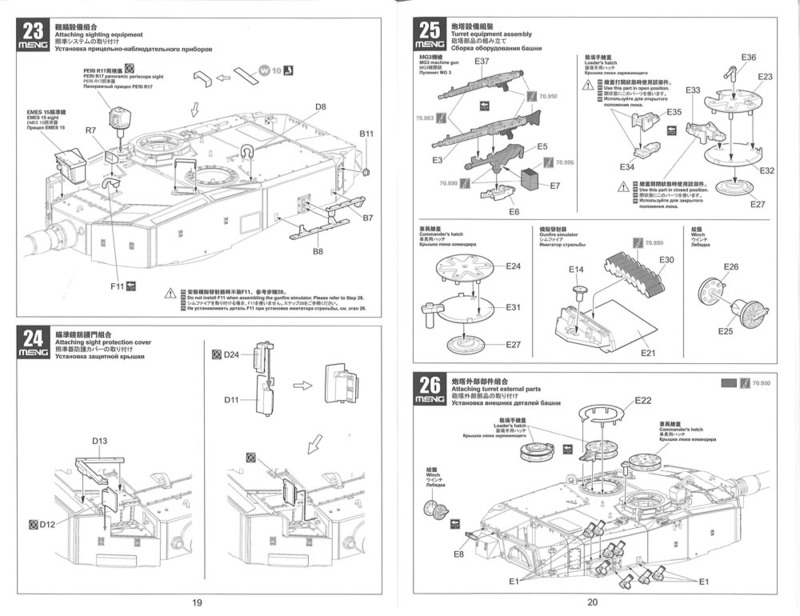 A jig is included to help with the build up and Meng say that glue is not necessary. I have press-fitted some links together and can confirm this is true. They should not take too long to build either - so don't be put off by individual links. If you read my Leo 1 track review you will see that they do not like white spirit/oils. 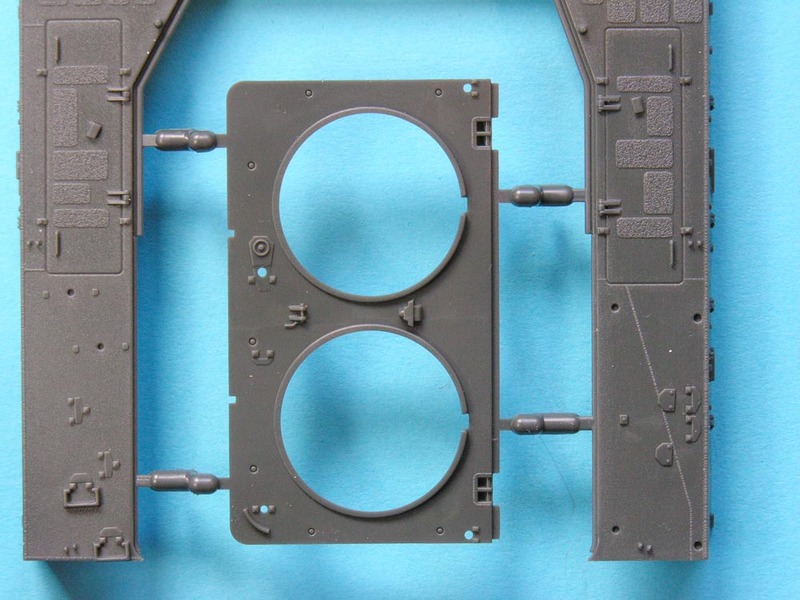 The same is going to apply to these Leo 2 tracks, so use water-based washes for weathering. Optional rear-view mirror arms are supplied for either upright or folded down options. Self-adhesive pre-cut silver foil is also supplied for the mirror glass. 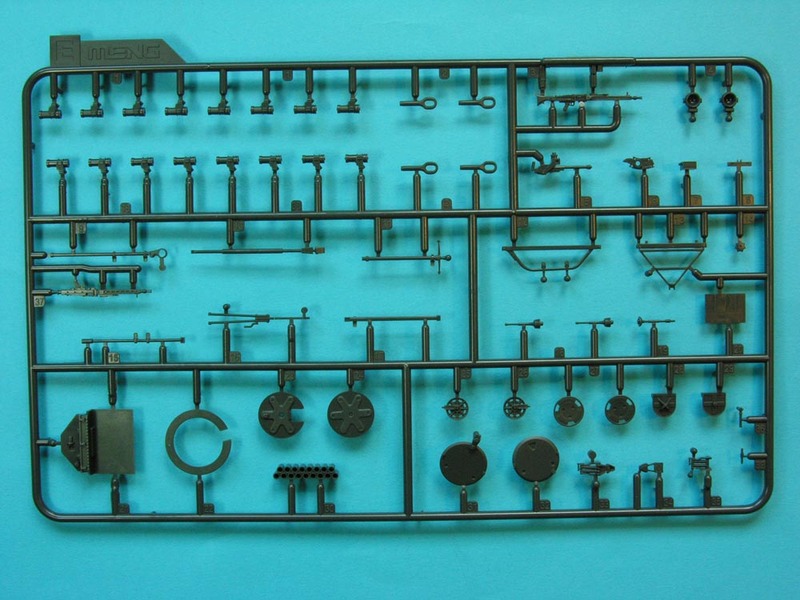 All of the hull top tools have very fine attachment loops. These have a thin film inside them which can be cleared if you are very careful for a more 'photo-etch'/accurate appearance. The base mounts for the tools are moulded onto the hull. The circular forward intake covers have fine mesh to wrap around them. Nice! The two large rear grilles have two layers of etch to add to them - a six-armed support frame and the top mesh screen. The tow cable supplied in the kit should be thrown in the nearest bin. 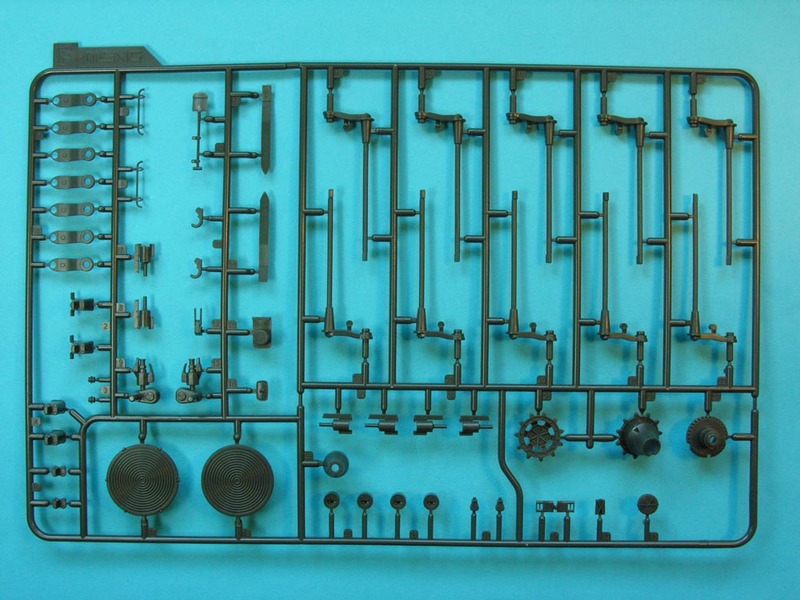 The quality of the whole kit makes you wonder why Meng haven't supplied braided brass cables. Eureka make a much better option. Another option!! Two styles of side skirt are supplied. 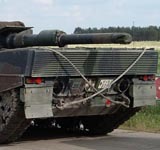 Leopard 2 was built in eight batches. Batch 6 and 7 introduced the same style heavy front skirts (the first three panels) that were developed for 2A6 and 2A6. The rear sections stayed the same. For Batch 8, the entire skirt matched 2A5/2A6. The Batch 8 skirts do not need the bracketry on the hull of the early skirts. 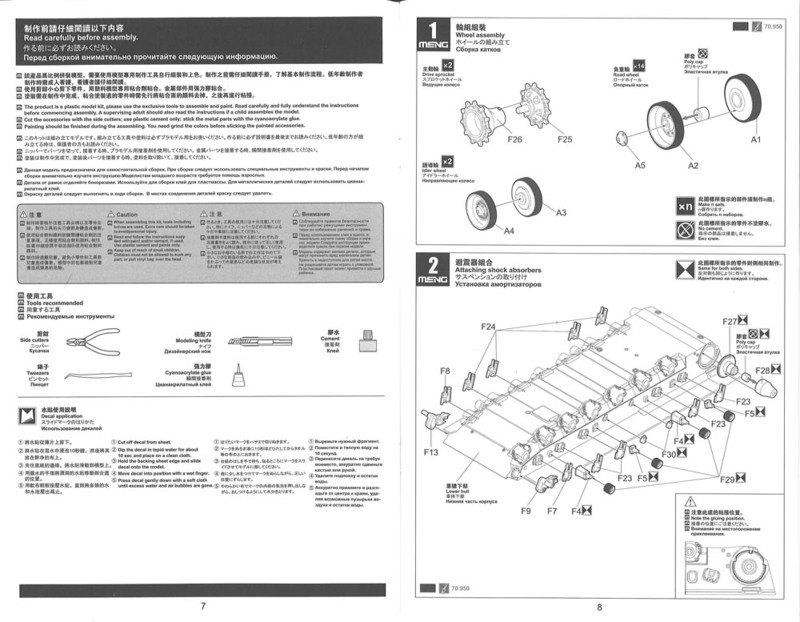 The instructions don't mention the Batch 6/7 option, but Batch 8 is included as an option to the earlier, more familiar skirts. 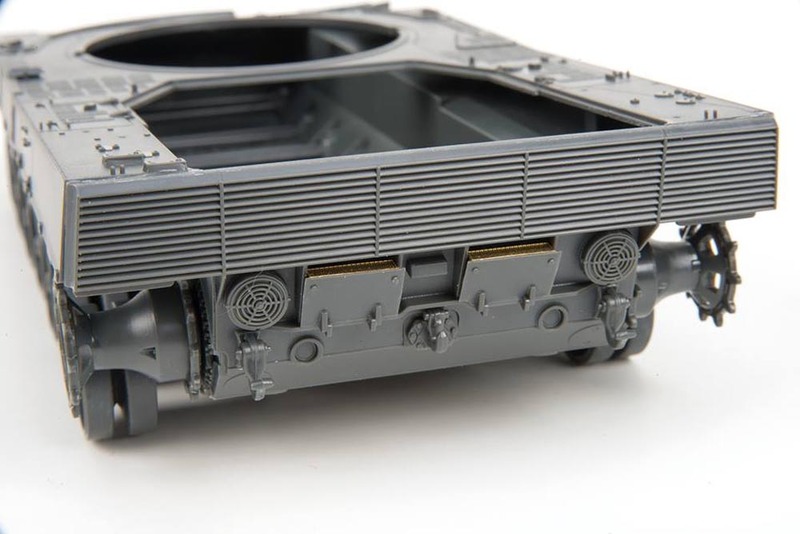 The inside faces of the front skirts have detail on them, so they can be modelled in the rail transport mode. The earlier skirts are simply lifted through 180° and locked into a near vertical position. The Batch 8 skirts fold in a different way. They are identical to 2A5/2A6 skirts. Their back plate is left down (parts B46 and B50). 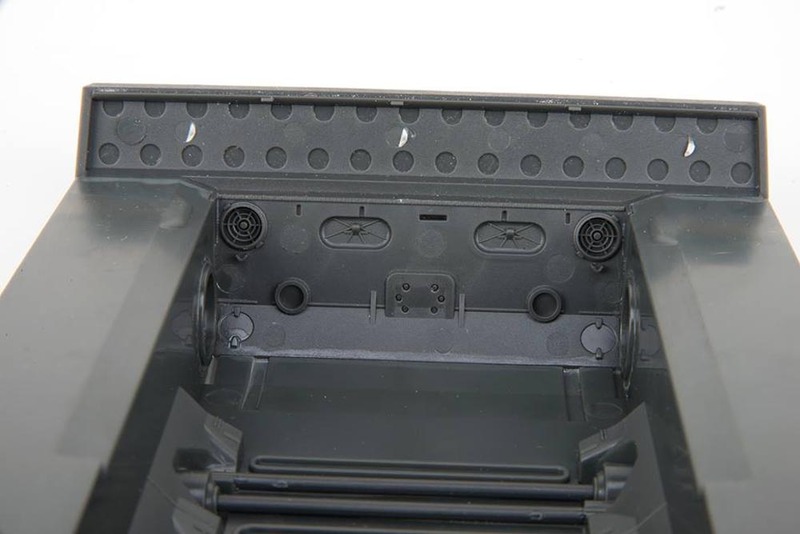 The outer plates (B2, B3, B1, B4) hinge 180° downwards on the bottom edge of the back plate. None of the above is mentioned in the instructions - though it is noted on the box top! 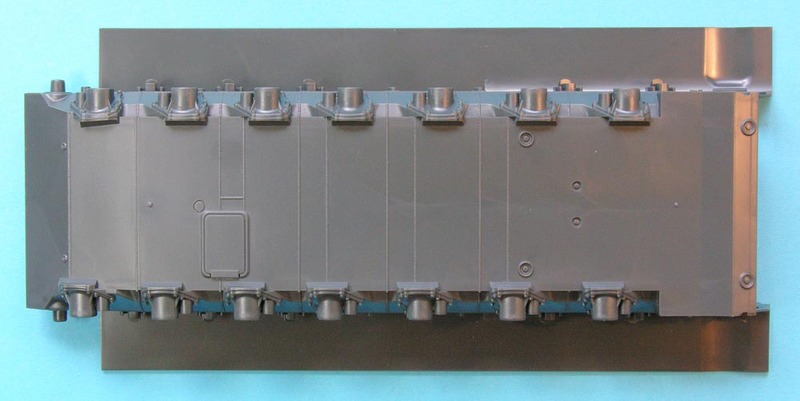 However, one problem is that the front section of the Batch 8 skirts should be separate as they fold over the hull top on arms (F12). These skirt sections will therefore have to be cut off. 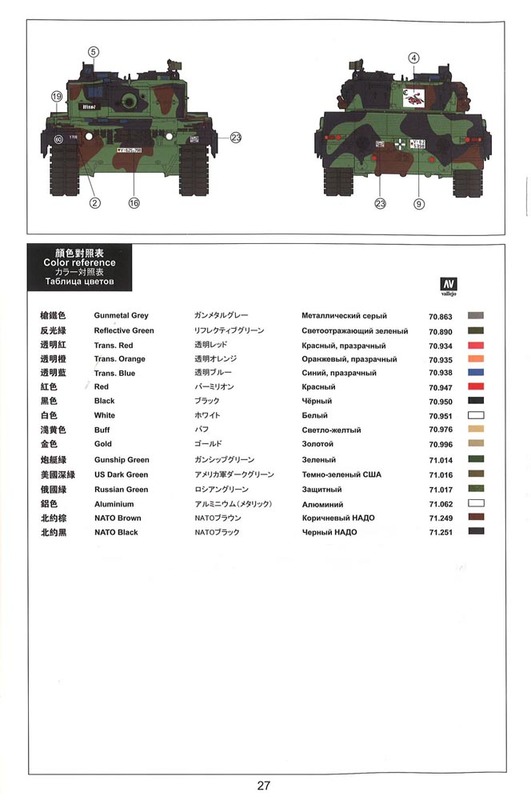 For once, mantlet plugs have been included! 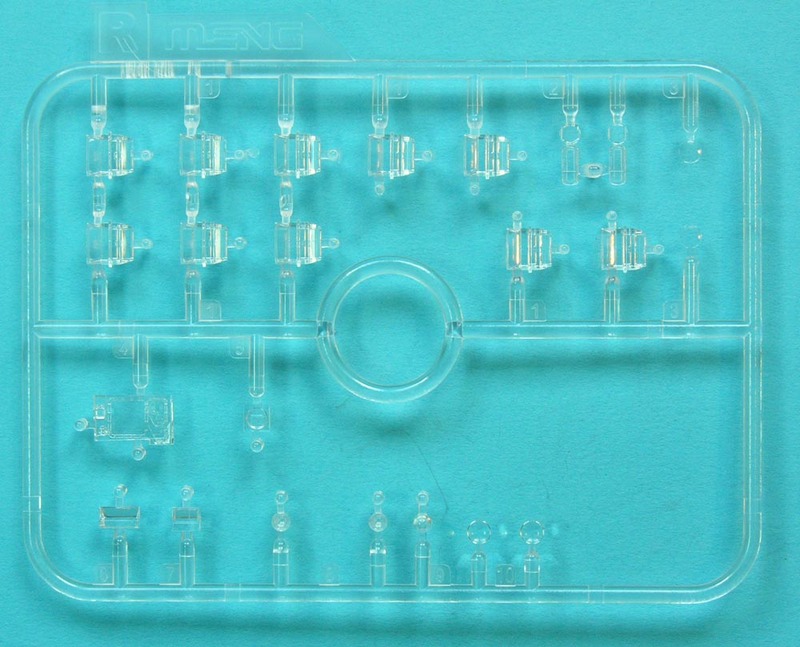 These are on the vinyl sprue and they have photo-etch chains, too! Thankfully, the plugs nor the chains have the finesse of Leopard Workshop's plugs. I know I'm blowing my own trumpet, but it is true! Staying on the glacis plate, the large hatch was originally bolted in place from Batch 1-5. It was bolted and welded - as per the kit - in later upgrades. From Batches 6-8, it was welded, so remove the bolts. Some careful scoring will have to be done if you want to 'unweld' it. The gun is the usual split in half affair with optional muzzles - early plain and later with collimator. This is possibly the most disappointing aspect of the kit as the fume extractor is distinctly skinny and the dust cover doesn't have the correct attachment bands. Leopard Workshop now has replacement guns available (LW017M). The gun is mounted in poly caps so it remains mobile. 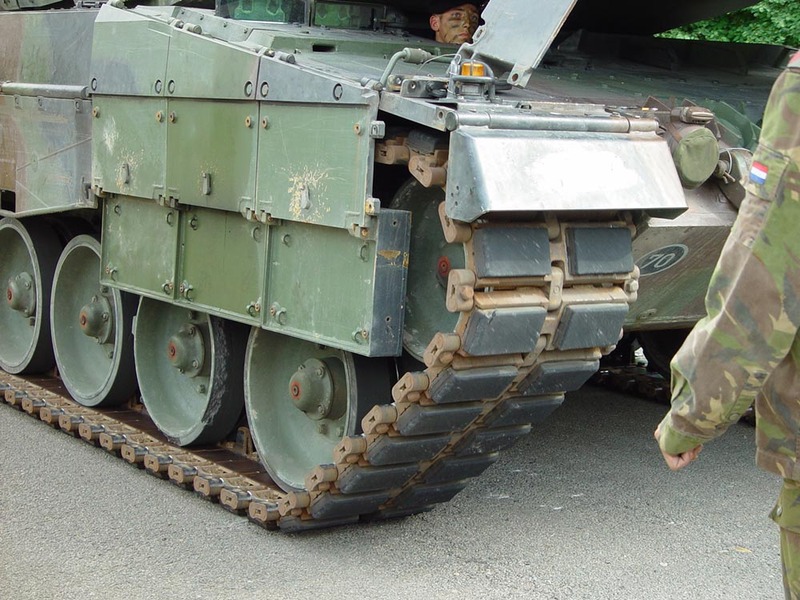 The mantlet cover is also vinyl and the way it is designed it looks like the gun may retain at least some mobility. The periscopes are all clear as are the sight windows for the PERI R17 and the EMES 15. The EMES window even has an impression of the sight inside it - nice! 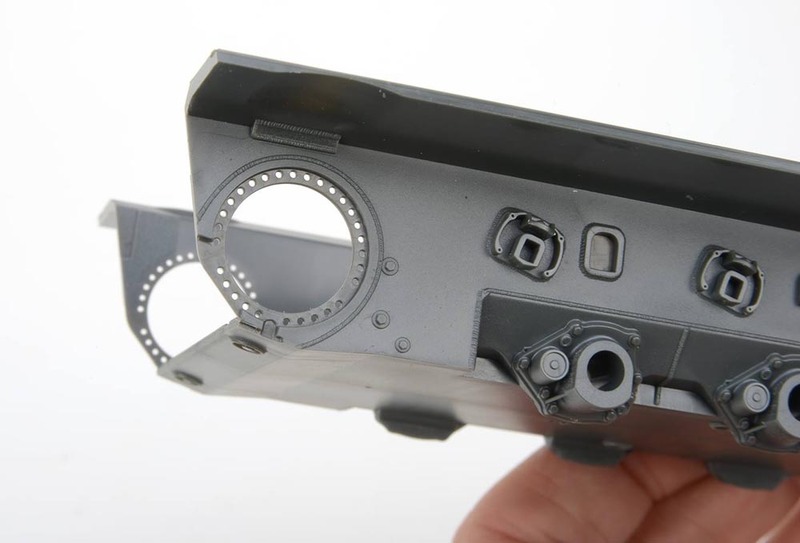 Both sights are multiple parts and not the usual blobs of plastic. The painting call out for the EMES window suggests blue for both windows. In fact, the outer window is tinted black and the inner window is clear. Both sights have wipers! The PERI even rotates on its own polycap and the EMES doors are hinged. 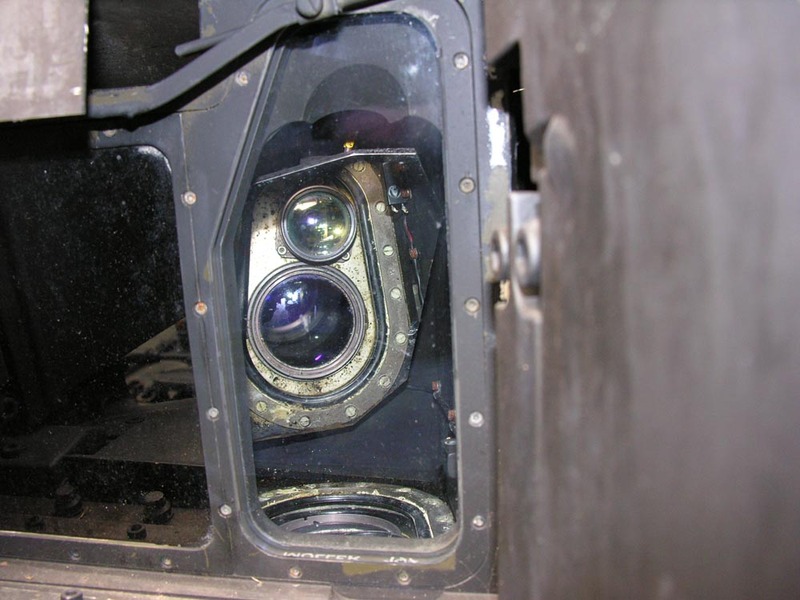 Periscopes have to be fitted from inside the turret top before the bottom is added. 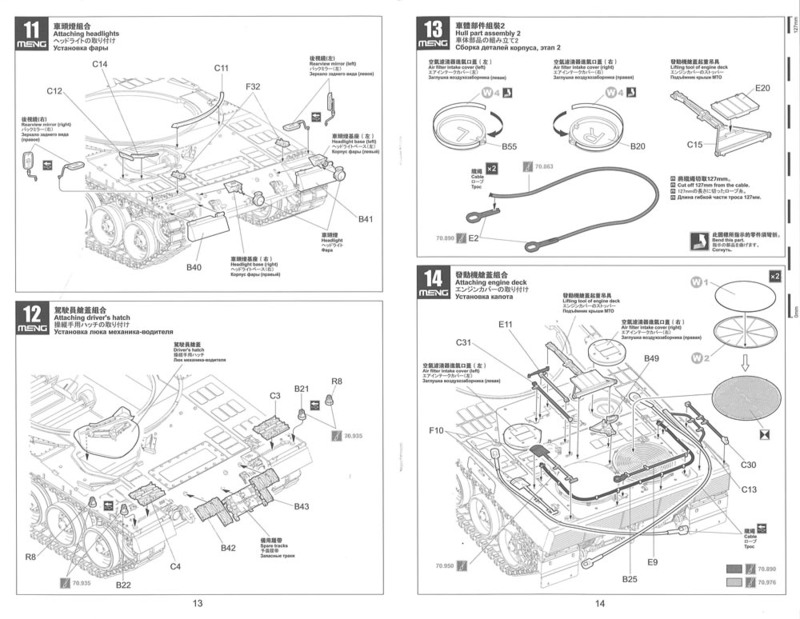 The turret rear plate has two options - one with and one without the snorkel seal. 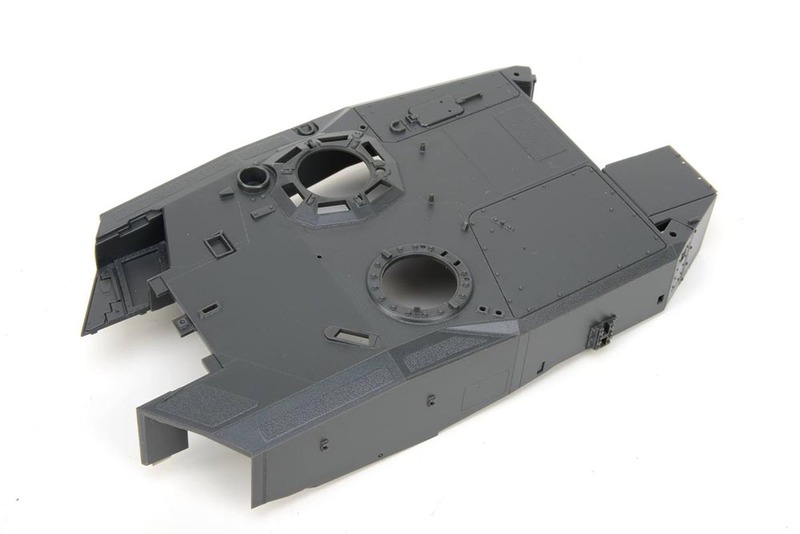 The whole turret rear is far better detailed than any other 2A4 kit. The same goes for the rest of the turret, of course. The hatch on the side of the turret is depicted as welded shut which happened during Batch 4. From Batch 6 onwards, the hatch was completely deleted, so sand off the weld line. The two turret rings are nicely thin and periscope covers are bent from etch. Alternate MG3s are provided both with and without butts. Both are nicely rendered. 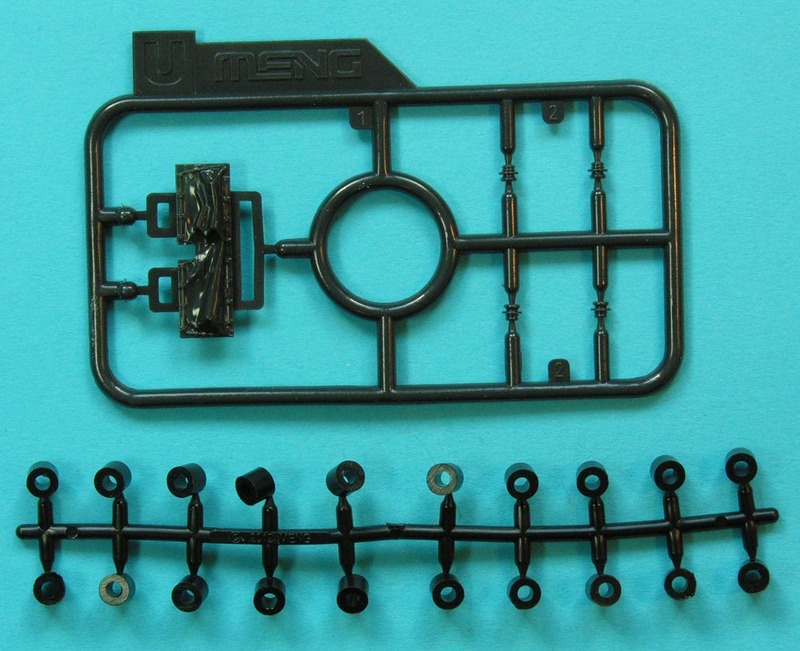 A notable omission from the etch fret are chains for the smoke launchers. A gunfire simulator is included which even has a curly plastic lead which has to be lead through the loader's periscope opening - so leave out the periscope if you do this. There is even a clear plastic flashing roof light supplied and more mantlet plugs and chains!! This is a bloody marvelous kit - pardon my French. (That's not French - just sayin' - webmaster) As with any kit, there are one or two quibbles, but these are very minor. 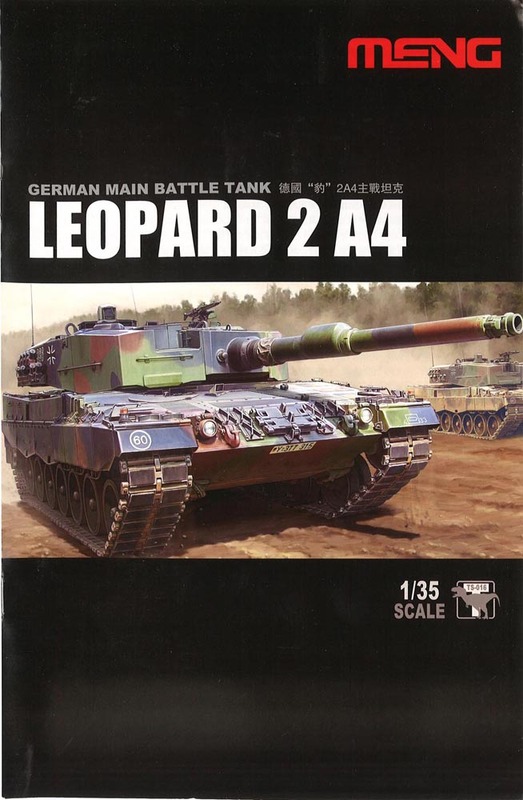 Overall, this 2A4 is a quantum leap over any other Leopard 2 kit from any other manufacturer. 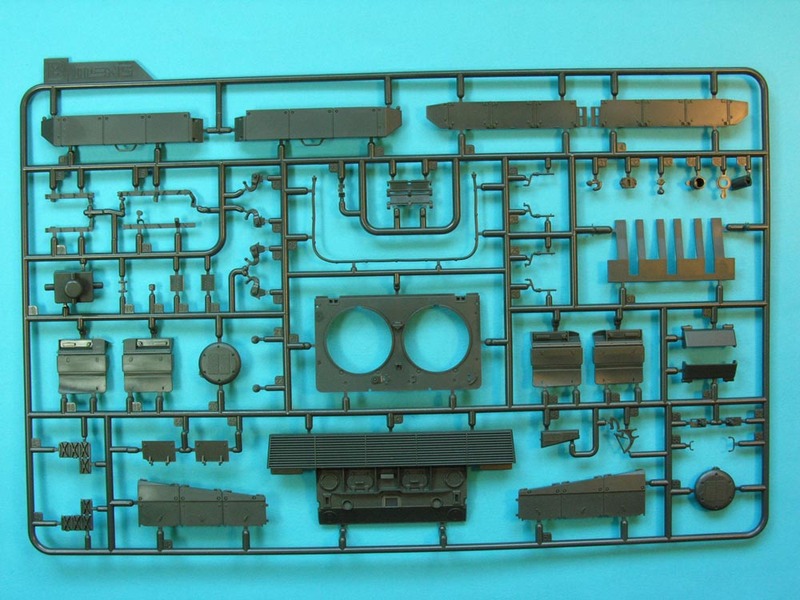 As great as the Tamiya 2A5 and 2A6 are, this kit edges them into second place with its options, separate engine deck plates, individual track links, clear parts, photo-etch and mantlet plugs! Well done Meng!! This kit is thoroughly and very highly recommended. Thanks to my debit card and Hobby Easy for supplying the sample model so quickly. Also thanks to David Parker of Meng AFV Modeller for sharing some of his photographs.